Democratic politicians eager to stand in solidarity with the Muslim community and speak against hate in the wake of the recent heated presidential election threw their support behind some of its most extreme elements. Virginia Attorney General Mark Herring, together with local Democratic politicians from Northern Virginia, made this evident when they showed up at a Veterans Day event at the Dar al-Hijrah Islamic Center in Falls Church, Va.
Dar al-Hijrah stands in infamy as the mosque attended by two of the 9/11 hijackers and where the late Al-Qaida terrorist leader Anwar Awlaki served as an imam. A 2002 U.S. Customs and Border Protection database report obtained by the Investigative Project on Terrorism (IPT) described Dar al-Hijrah as a "front for Hamas operatives in [the] U.S." A 2007 report said the "mosque has been under numerous investigations for financing and [providing] aid and comfort to bad orgs and members." 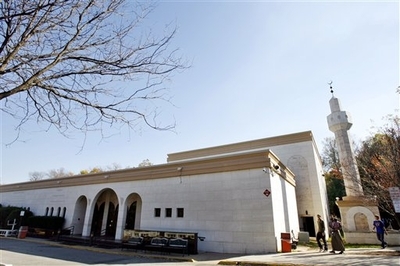 The Washington Post noted in 2011 that "almost no other mosque in the country has been linked to so many cases of alleged terrorism." Randall "Ismail" Royer, who pleaded guilty to participating in a plot to train with the Lashkar-e Tayyiba terrorist group. A 2001 FBI memorandum described former Dar al-Hijrah imam Mohammad al-Hanooti as "an active HAMAS supporter, purportedly holding fund-raising activities, as well as supporting visitors to the United States from Israel and Jordan, to speak on behalf of HAMAS." On Veteran's Day, Herring and his fellow Democrats stood with Dar al-Hijrah leaders Esam Omeish and Imam Shaker Elsayed, each of whom has advocated violent jihad in the past.. In 2007, then-Virginia Gov. Tim Kaine withdrew Omeish's nomination to a state immigration commission after the IPT released footage from a 2000 rally showing the physician praising Palestinians for adopting the "jihad way" for liberation. Four years later, Omeish blasted Israel's targeted killing of a Hamas founder, saying, "this is our tax money and it is our dollars that killed our beloved brother Sheikh Ahmed Yassin." Elsayed, then imam of Dar al-Hijrah, endorsed violent jihad in February 2013 during a talk at T.C. Williams High School in Alexandria, Va.
"Muslim men when it is a price to pay, they are first in line ... But they are last if anything is being distributed, unless it is arms for jihad ... We are the first to rush and run to defend our community and defend ourselves. The enemies of Allah are lining up; the question for us is, 'Are we lining, or are we afraid because, because they may call us terrorists,'" Elsayed said. In a 2004 story about the Muslim Brotherhood in America, the Chicago Tribune quoted Elsayed describing Brotherhood founder Hasan al-Banna's ideals as "the closest reflection of how Islam should be in this life." Al-Banna's vision that the Brotherhood still follows ultimately calls for establishing a global Islamic state. Al-Banna described jihad as "slaying of the unbelievers, and related connotations, such as beating them, plundering their wealth, destroying their shrines, and smashing their idols." Just last week, Omeish hailed the Egyptian Muslim Brotherhood in a Facebook post: "We have not known of humane brotherliness and its people, (and we are affiliated with all men whom Allah has created a propensity for love, mercy, an upright disposition, good morals and honorable character) better in ethics, of gentler parts, deeper in adherence to duty, nobler in morals among all their sons, and everyone of their actions than the Muslim Brotherhood." Herring's office refused to comment about the appropriateness of Virginia's highest law enforcement officer participating in the event. Herring and his fellow Democrats ignored these past connections and radical statements. "I would like to thank Imam Johari for extending the invitation to me to come by and visit. It's always good to visit with friends, and it is good to be back and wonderful to see you," Herring said. "You and the Muslim community are a vital part of our region, our state, and our country. I don't have to tell you. This has been a tough and difficult election season for everybody. "I have stood with you before, and I will continue to stand with you." Other politicians who spoke at the event include Fairfax County Supervisors Penny Gross and John Foust, Fairfax County School Board Chairwoman Sandy Evans, State House delegates Jennifer Boysko and Alfonso Lopez, and a representative of Congressman Don Beyer. "Like so many of you, I am still stunned and reeling from the events of this week and the politics of fear, intolerance, and hatred, but I know we will go on, and I know we will fight fear with courage. We will fight intolerance with kindness. We will fight divisiveness with banding together in unity," Evans said. Gross stressed the need to be a loyal opposition against President-elect Donald Trump and "internalize the values we hold so dear in this county." A spokesperson for the Fairfax County Police told the Investigative Project on Terrorism that no hate crimes against Muslims or mosques were reported in Virginia's most populous county in the wake of the election. Lopez, who drew criticism in 2014 for drafting a resolution in the General Assembly celebrating Dar al-Hijrah's 30th anniversary, vowed he would continue to stand with Dar al-Hijrah. Zuhdi Jasser, president of the anti-Islamist American Islamic Forum for Democracy, said the Democrats are "enabling groups with an Islamist insurgency ideology." Jasser's group approached Dar al-Hijrah last May seeking support for his group's Muslim Reform Movement declaration affirming American liberal values such as opposition to hate and bigotry, women's and minority rights, and secular governance. The mosque's leadership read the declaration, but declined to sign it, Jasser said. He claimed that Johari Abdul Malik, an imam at Dar al-Hijrah, told Jasser privately that he agrees with many of his views. That doesn't matter as long as his mosque doesn't preach liberal values publicly and works to radicalize and separate Muslims from the rest of America, Jasser said. "The Democrats have no sense of the values of the Muslims they are embracing who have values well to the right of anyone in America," Jasser said. Books obtained by the Investigative Project on Terrorism at Dar al-Hijrah in 2013 likewise stand at odds with the Democrats' stated values. They express open hatred for Christians, Jews, and other non-Muslims. Additionally, they express a supremacist view of Islam over other religions. They include In Pursuit of Allah's Pleasure, written under the supervision of 1993 World Trade Center bombing mastermind Sheikh Omar Abdel Rahman. "The revelation of Surah at-Taubah (Surah No. 9) set out in detail the Shari'ah's position on all these categories. He was instructed by Allah to fight the People of the Book (the Christians and the Jews) until they paid Jizyah (tribute) or embraced Islam. He was also instructed to fight the disbelievers and hypocrites and be harsh on them," In Pursuit of Allah's Pleasure says. The Ideal Muslim Society, by Dr. Muhammad Ali Hashimi, talks about diverting zakat funds, ordinarily used as charity to help the poor, to fund jihad. "The most important of these (other uses for zakat) is jihad for the sake of Allah because the Muslim ummah should focus on conveying its message to the world," Hashimi writes. Another book obtained by the IPT was written by top Muslim Brotherhood cleric Sheikh Yusuf al-Qaradawi. "Palestine will ultimately be freed and the Jews conquered," The Desired Muslim Generation says. "The whole universe will be on their side; even trees and rocks will somehow support them by saying: 'O Muslim O Abdullah [slave of Allâh (I)] Here is a Jew hidden behind me come and kill him.'" Qaradawi visited Dar al-Hijrah before the Clinton administration banned him from entering the U.S. in 1999. He also notably praised Hitler for killing Jews in the Holocaust and endorsed suicide bombings. Democrats need to take the rhetoric of their allies within the Muslim community seriously, lest they muddle their message as being a party opposed to hate and bigotry.